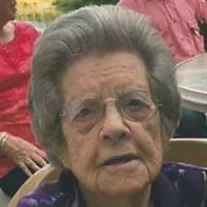 Hilda Elaine Parrish, 91, quietly slipped from this world to the next Saturday morning, November 3, 2018 surrounded by family, after a long battle with Alzheimer’s. She was preceded in death by her husband, Manuel Parrish; her son, Randy; daughter-in-law, Barbara Parrish; and son-in-law, Michael Jenkins. She was also preceded in death by six brothers and a sister, and was the last surviving member of L.H. and Lela Gilley’s family. She is survived by son, Danny Parrish and daughter, Sandra Jenkins. She has seven grandchildren, Tim (Tena Niceswanger) Parrish, Casey (Michael) Newton, Terri (Chris) Jenkins-Suggs, Rachel (Adam) Lawing, and Beka Jenkins; as well as seven great-grandchildren, Sidney and Tyler Newton, Destin, Taylor, and Hannah Parrish, Thao and Remi Lawing. She also leaves many extended family and friends who felt as if she was just as close as a mother. Elaine spent her life caring for others and quietly demonstrating her faith and her strength. As the wife of a Baptist preacher, she attended many local churches, but spent most of her later years at Lookout Baptist Church. She loved God, family, gardening, traveling and cats. Recently, she visited Maryland and Maine on RV trips to see grandchildren and new great-grandchildren. Special thanks to those who helped care for Elaine this past year: cousins, Leon and Jean Ellis, and Gwen Hisey, as well as many “church family” and Chattanooga Hospice. Visitation will be on Saturday Nov 10 at Wilson Funeral Home in Fort Oglethorpe from 10 a.m.- 2:30 p.m., with services at 3 p.m. at Lookout Baptist Church at High Point. In lieu of flowers, donations can be made to Alzheimer’s Association, Chattanooga Hospice or Lookout Baptist Church.